I woke up Sunday morning thinking about seafood. Mussels to be exact. Those black shells glistening in a simmering bath of white wine and butter. I’m not really sure why….I wasn’t hungry…but never the less, I wanted seafood. And then later during the day, it changed from mussels to little neck clams due to something we were watching on TV (there’s a slight possibility I may watch too many food shows on TV). Recipe in hand, I head to Central Market to procure the necessary items to conjure up this fabulous looking dish….only to discover that they have no little neck clams….or any clams for that matter. Ok, Ok, I can deal with this. I was kind of afraid this might happen, so I pull out my back up recipe for mussels that I had printed out. Always good to come prepared. Only to discover that they were out of mussels, too!! What are the odds? Ok….quick….need another option quick as the people in line start to mumble and groan and discussions of a lynching were beginning for this person who was taking way too long and holding them up (at least that’s what it seemed like they were doing in my mind). 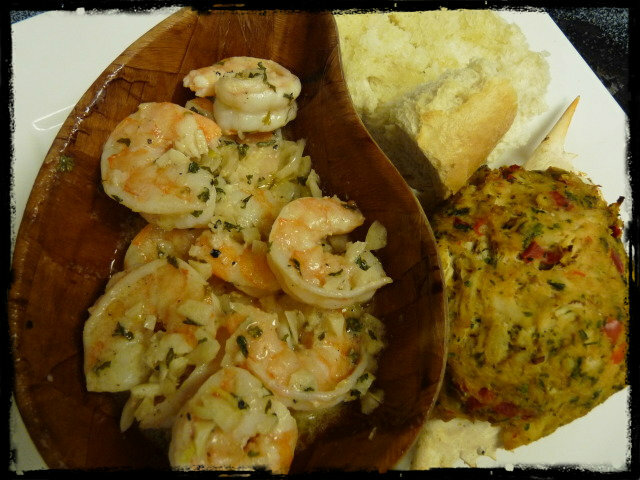 That’s when I remembered Chris over at NibbleMeThis posting for Shrimp Scampi last week. Quick glance….they have shrimp and it’s not priced badly. 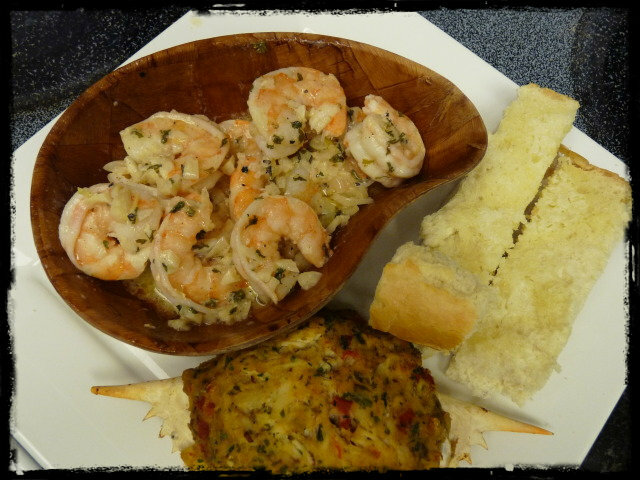 Oh…and throw in two of those stuffed crabs just for fun. Done and out the door. Time to head home and whip up some dinner for Mrs. G and myself. Preheat a charcoal grill to 450f set up for indirect grilling. 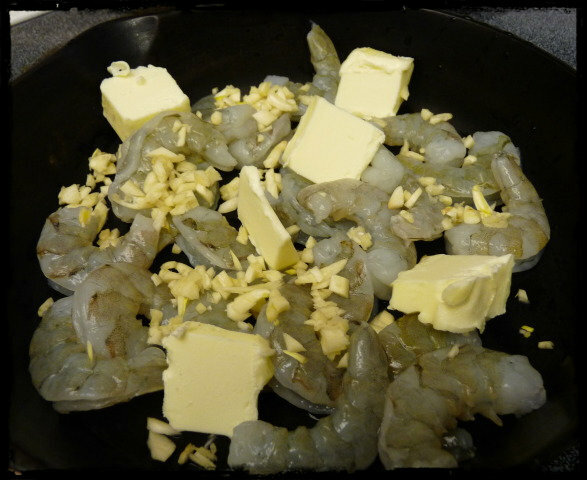 Divide the shrimp into 4 au gratin dishes (or other oven safe ceramic dishes). Add the butter, garlic, and wine. Season each dish with a pinch of fresh ground black pepper. 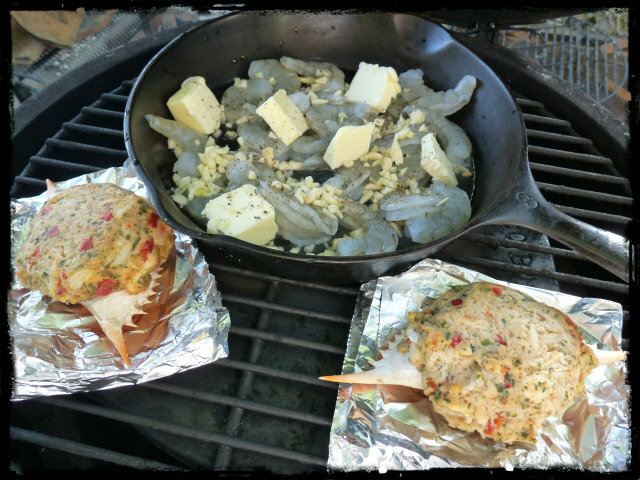 Roast the shrimp in the grill with the lid closed until they turn pink, about 7 minutes. Remove and sqeeze the lemon* halve over the dishes to give each just a splash. Season each dish with a pinch or two of salt. Garnish with a little parsley if you like. Serve with crispy toasted garlic bread. I like to grill my lemon cut side down over direct heat for 1 or 2 minutes at the end for a flavor boost. I did change thing a bit from Chris’s recipe. I set up my Egg indirect at 400F (not 450F) with the placesetter legs down and the grate on top of that. The reason behind this was I was told to bake the crab at 350F in the oven for around 15 minutes. I figured the crab would be fine at a little higher temp and the shrimp would do well at a lower temp (although they might take a bit longer) so I split the difference at 400F. I also don’t have those cool, little au gratin dishes that Chris used so I improvised and pulled out my trusty cast iron skillet. 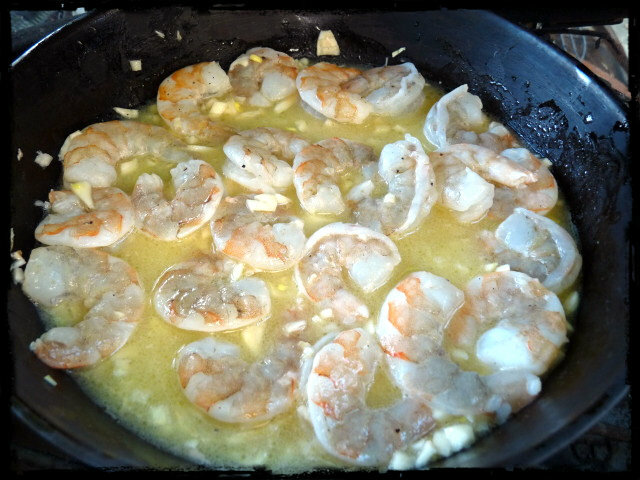 The shrimp took around 10 minutes to cook, stirring a few times to ensure that they were cooking evenly. Chris was right. “The garlicky aroma, the velvety butter sauce, and fresh Florida shrimp made me a happy dude.” I was one happy dude, even though these were Texas Shrimp from the Gulf. I quickly devoured mine and used the bread to erase any trace that their might have been a sauce in the bowl. This stuff was amazing. Better than any I had ever ordered from a restaurant. I don’t even care that scampi is not a true Italian dish and that it was created right here in America. Who cares? This stuff was just plain good. I just wish that I had remembered to check and see if there was any pasta in the pantry before I ran off to the store. It would have been nice to serve it on a steaming bed of linguini or cappellini. Maybe next time. I’m not real sure what the guy behind the counter was thinking about the crab. 15 minutes at 400 didn’t get them done, they were still cold inside. It took way over 20 minutes to finish them (but that was ok as we had the shrimp to make us happy while we waited. And the bread to soak up the sauce). As for the crab itself….meh. Didn’t really have a lot of flavor. There was plenty of crab in it and not just breading. As for whoever separated the crab meat, that guy must have been on something. I swear I got a bit of shell in every bite I took. I think I’ll pass on these next time and just eat more of the yummy shrimp scampi. Delicious! 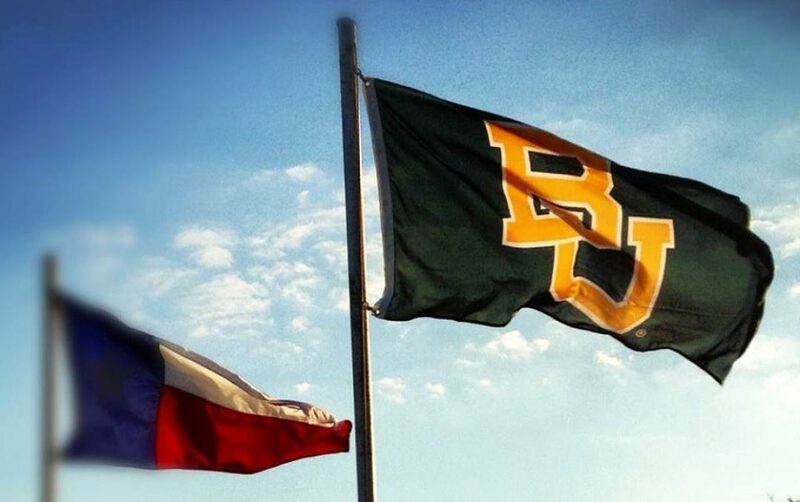 I can almost smell it from here! Mmmmm….garlic and butter. The aromas were tantalizing. I want to be one happy Dudette! Wow, that looks amazing. I’m glad that they were out of clams so you were forced to make this. Now I have a new recipe and I get to go check out a new blogger. Double score. But I thought Dudette was you daughter? 😉 I’ll get back to that clam recipe someday, but this was a great meal instead, although not quite healthy. You really should check out Chris’s blog. He’s a much better photographer and blogger than I am. Nummmm. I’ve just entered a jealous foodie coma! love scampi! the one pan dish is the single persons dream. Never even thought to do on bge…. and have au gratin dishes 🙂 Thanks for sharing. can smell that garlic already!! Thanks, but you should thank Chris at Nibble Me This for posting it up first. Wish I had those cool au gratin dishes he has. Glad you liked the shrimp! And yeah, the cleaning up with bread is the best part.